Ground Penetrating Radar Systems was recently called by a local construction company to a project at Nationwide Children’s Hospital in Columbus, Ohio. Scope of work was to scan a concrete slab on grade locating and mapping out conduits before saw cutting to tie into an existing sanitary line. After scanning with GPR, there were several conduits that were marked out in the area of saw cutting that would have been struck if it had not been scanned. GPRS, LLC. was able to get to the job in a timely matter and mark out all the conduits on the surface with a depth. 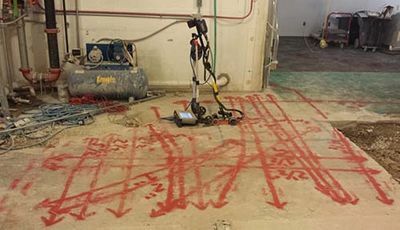 GPR is an accurate and effective way of locating conduits, rebar, and post tension cables in a concrete slab. For more information on how GPRS, LLC. can help you on your next project, please contact David Borcherdt at (614) 946-2120 or by email at david.borcherdt@gprsinc.com. We also have the capabilities of locating underground utilities, underground storage tanks, and voids.